Just for you!A great expirence for winter,looking unique and charming Details: Gender:Women Material:Wool Blended, 80% Polyester & 20% Wool Decoration:None Style:Casual Sleeve:Long sleeve Closure:zip-up & snap button Package include:1 pieces Attention Please: please double check the measurement carefully before you buy the item.1 inch = 2.54 cm Please note that slight color difference should be acceptable due to the light and screen Guaranteer: If it is the quality question,we will resend or refund to you;If you receive damaged or wrong items,please contact us and attach some pictures about your product and packages to us,we will confirm it with you ASAP. If you are satisfied with our product or service,please leave your positive feedback!THKS. Delievery: We ship it from USA,it takes about 3-5 days delivery, please wait for your item with patience,If over expected delivery time still have not received the goods, please don't leave negative evaluation immediately,contact us directly,we will resend or refund it to you.THKS! Material: Polyester + Cotton Package contents: 1 Long Coat Feature: Thick fabric, provides all-day comfort and warmth Garment Care: Hand-wash and Machine washable, Dry Clean Occasions: Party, Wedding, Homecoming, Daily, Cocktail, Club, Beach, Streets, Travel *Size Chart: *US 4/Tag Size S---Bust:98cm(38.6")---Length:110cm(43.3")---Sleeve:60cm(23.6") *US 6/Tag Size M---Bust:103cm(40.6")--- Length:112m(44.1")---Sleeve:61cm(24.0") *US 8-10/Tag Size L---Bust:108cm(42.5")--- Length:114m(44.9")---Sleeve:61cm(24.0") *US 12/Tag Size XL---Bust:113cm(44.5")--- Length:116cm(45.7")---Sleeve:62cm(24.4") *US 14/Tag Size 2XL---Bust:118cm(46.5")--- Length:118cm(46.5")---Sleeve:62cm(24.4") Kindly Notice: 1.There Is 2-3% Difference According To Manual Measurement. 2.Please Check The Measurement Chart Carefully Before You Buy The Item.1 Inch = 2.54 cm 3.Please Note That Slight Color Difference Should Be Acceptable Due To The Light And Screen. Specifications:Please check your measurements to make sure the item fits before ordering. 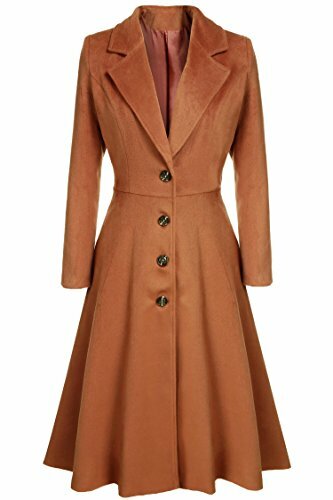 Style1 Measurements: Size S-----Shoulder 15.5"-----Sleeve 23.2"-----Bust 37.0"-----Waist 30.7"-----Length 30.9" Size M-----Shoulder 15.9"-----Sleeve 23.6"-----Bust 39.0"-----Waist 32.7"-----Length 31.5" Size L-----Shoulder 16.7"-----Sleeve 24.0"-----Bust 42.0"-----Waist 35.7"-----Length 32.1" Size XL----Shoulder 17.4"-----Sleeve 24.4"-----Bust 45.0"-----Waist 38.7"-----Length 32.7" Size XXL---Shoulder 18.1"-----Sleeve 24.8"-----Bust 48.0"-----Waist 41.7"-----Length 33.3" Style2 Measurements: Size S-----Shoulder 16.3"-----Sleeve 23.4"-----Bust 43.3"-----Length 29.3" Size M-----Shoulder 16.8"-----Sleeve 23.8"-----Bust 45.2"-----Length 29.6" Size L-----Shoulder 17.5"-----Sleeve 24.2"-----Bust 48.2"-----Length 30.0" Size XL----Shoulder 18.2"-----Sleeve 24.6"-----Bust 51.2"-----Length 30.4" Size XXL---Shoulder 18.9"-----Sleeve 25.0"-----Bust 54.1"-----Length 30.8" Note: As different computers display colors differently, the color of the actual item may vary slightly from the images,thanks for your understanding. 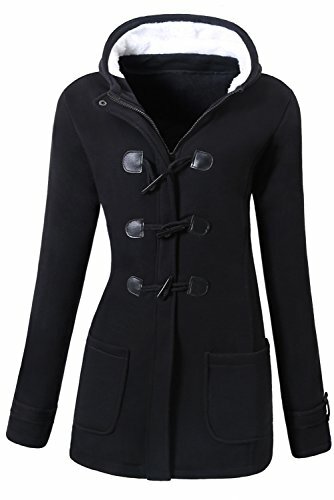 "Keep warm this winter with this wool coat from Tom's Ware Inc.It is so stylish and beautifully designed. 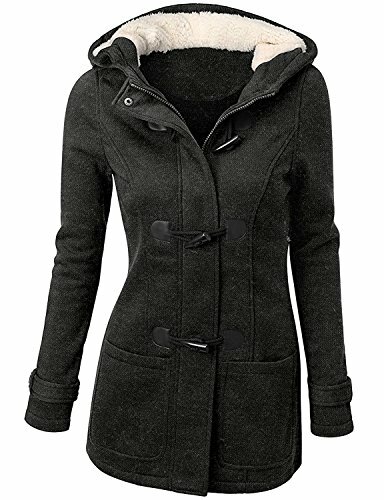 The coat features 2 sided pockets that blend right in, providing a hidden space for your keys and cell phone. 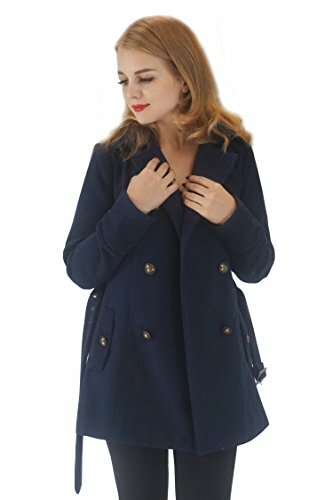 This stylish wool coat has a chic notch collar and 10 front buttons. 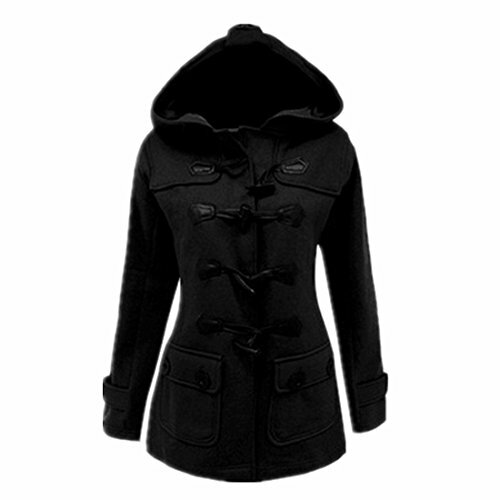 The wool material is sturdy, and the inner lining combines with the wool to protect you from bone-chilling winter winds. 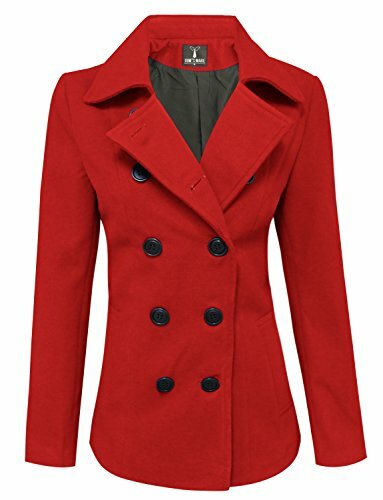 Functional and fashionable, this classic peacoat is a must-have forany modern woman's wardrobe which makes it a timeless seasonal style. 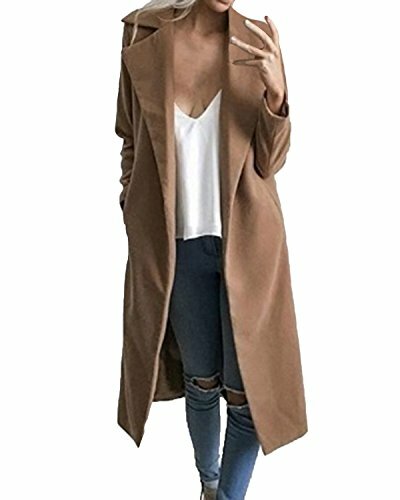 A must have for your closet collections. 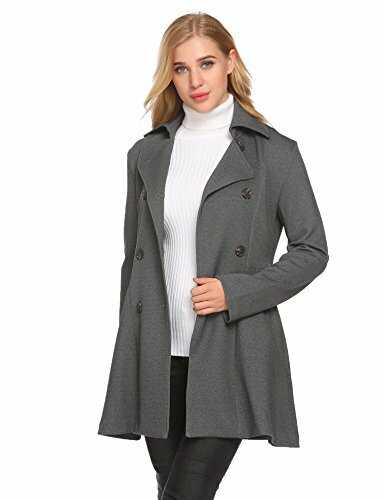 Materials: 35% Wool, 65% Rayon, Lining: 100% nylon This is our sizing guide cm (Inch) XS --Shoulder: 38 cm(14.96")-- Chest: 88cm (34.65")-- Sleeve:60cm (23.62")-- Length:62cm (24.41") S --Shoulder: 40cm(15.75")-- Chest: 94cm (37")-- Sleeve:61.5cm (24.21")-- Length:64.5cm (25.39") M --Shoulder: 43 cm(16.93")-- Chest: 102cm (40.16")-- Sleeve:63cm (24.8")-- Length:67 cm (26.38") L --Shoulder: 46cm(18.11")-- Chest: 110cm (43.3")-- Sleeve:64.5cm (25.39")-- Length:69.5 cm (27.36") XL --Shoulder: 49cm(19.29")-- Chest: 120cm (47.24")-- Sleeve:66cm (25.98")-- Length:72 cm (28.35") XXL --Shoulder: 52cm(20.47")-- Chest: 130cm (51.18.") 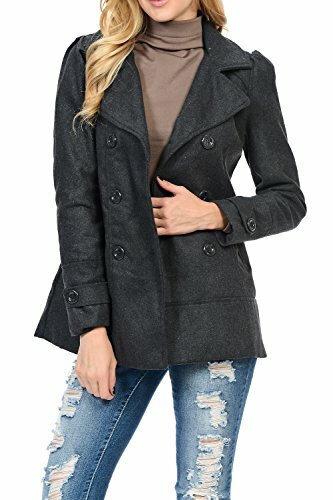 -- Sleeve:67.5cm (26.57")-- Length 74.5 cm (29.33") "
Compare prices on Pea Coat Female at ShoppinGent.com – use promo codes and coupons for best offers and deals. Start smart buying with ShoppinGent.com right now and choose your golden price on every purchase.